SETG will test the hypothesis that life on Mars, if it exists, shares a common ancestor with life on Earth. There is increasing evidence that viable microbes could have been transferred between the two planets, based in part on calculations of meteorite trajectories and magnetization studies supporting only mild heating of meteorite cores. Based on the shared-ancestry hypothesis, this instrument will look for DNA and RNA through in-situ analysis of Martian soil, ice, or brine samples. By applying recent advances in microfluidics, embedded systems, and biological automation, our team is developing an instrument that can isolate, amplify, detect, and classify any extant DNA or RNA-based organism. On Earth, very simple but powerful methods to detect life by the DNA polymerase chain reaction (PCR) are now standardly used. Due to massive meteoritic exchange between Earth and Mars (as well as other planets), a reasonable case can be made for life on Mars or other planets to be related to life on Earth. The sensitive technologies used to study the extremes of life on Earth can be applied to the search for life on other planets. Team is working to develop a PCR detector for in situ analysis on other planets, most immediately, Mars. Strategies for detecting life on other planets have sought to avoid the assumption it would share any particular features with life on Earth. The most general strategies — seeking informational polymers, structures of biogenic origin, or chemical or isotopic signatures of enzymatic processes — look for features that all life is expected to exhibit. This generality comes at a cost: the strategies are not particularly sensitive, and more importantly, there are abiological routes to these life signatures. However, if life on Earth is actually related to life on other planets, we can use a far more powerful and information-rich technique developed to detect the most extreme forms of life on Earth. On March 19, 1999, David McKay announced at the Lunar and Planetary Science Conference in Houston, that an additional pair of Martian meteorites contained “true micro-fossils from Mars.” The fossils actually resembled Earth bacteria in the process of reproducing. These “micro-fossils were found in a 1.3 billion year old Martian meteorite which fell to Earth near Nakhla, Egypt, and nanofossils were found in a 165 million-year old Martian meteorite that fell near Shergotty, India. On October 31, 1996, British scientists and planetary geochemists, Colin Pillinger, Ian Wright, and Monica Grady, announced that they too had discovered evidence that life once existed and thrived on the red planet –Martian life that flourished as recently as 600,000 years ago. The British team analyzed two different Martian meteorites, including the fist sized rock scrutinized by NASA scientists. Specifically, they discovered a variety of organic compounds including complex organic molecules produced by and associated with carbon-based life forms in a chunk of Mars (EETA 79001) that had been blasted out some 600,000 years ago. By analyzing the various atomic weights of these chemical substances, the British team also reported that the ratios discovered match those of the oldest fossils and bacteria found on Earth; e.g. archaebacteria. Moreover, these scientists discovered “microbially produced methane” similar to the methane produced by bacteria known to live in cow guts as well as other locals on Earth. That is, they discovered chemical residue reminiscent and suggestive of cow flatulence! Farting cows on Mars? Because of the low temperatures, and lack of sufficient atmospheric shielding, water on the surface of Mars will either freeze, or boil off and turn to vapor. And yet, incredible amounts of water is frozen in the permafrost. On 2008 NASA’s Phoenix Mars Lander touched down north of the Martian arctic circle. and beamed back evidence of freeze-thaw cycles in what proved to be frozen water within a couple inches of the top of the soil. Soon snow was sensed falling from the Martian clouds, and its camera captured images of hoarfrost. It also detected perchlorate, an energy source used by some Earthly microbes. Evaporating ice on Mars over a 4 day period On earth innumerable species live within the permafrost, and even miles beneath frozen ice. Some are active. Yet others are dormant and awaken from their icy slumber when the ice begins to thaw. Similar conditions favorable to biology are also present on Mars. Because of seasonal changes in the tilt of the planet’s axis and its elliptical orbit, which brings it periodically closer to the sun, Mars’s poles warm dramatically releasing water which flows across the surface. Likewise, when exposed to sunlight, Martian rocks and soil are sometimes heated above freezing and water leaks onto the surface. Unfortunately, the rovers and the Phoenix were not designed to test for the presence of life. Nevertheless, evidence for life on Mars was discovered in 1976, though for reasons that are not at all clear, NASA issued conflicting reports about the findings. Part of the problem was due to the fact that the two Viking space craft were sent NOT to where life may exist, but to those regions of Mars the least likely to contain life. The exploration sites were chosen for safety and not science. In addition, the equipment and experiments conducted by the Viking landers were not designed or calibrated properly, and were not sufficiently sensitive to detect the presence of microbes which might be living in permafrost or frozen tundra. Yet, even with these limitations, biological activity associated with microbial activity including reproduction, was in fact detected. Specifically, the “Labeled Release” (LR) experiment took a sample of Martian soil and added a nutrient that contained radioactive carbon. The purpose was to detect the presence of radioactivity in the gasses released that would indicate biological activity. A control experiment treated a second sample that had been sterilized. In every experiment conducted, positive results were obtained from the unsterilized sample, and negative results were obtained for the sterilized sample. Thus,the LR experiment proved there was life on Mars. However, a second series of experiments, employing a gas chromotagraph and mass spectometer was conducted to test for organic material associated with living organisms. Yet this experiment was so poorly designed and so insensitive that it would have been unable to find evidence of life on Earth under similar conditions. The GC/MS experiment required that a gram of soil had to contain over 100 million organisms before signs of life could be detected. When the GC/MS experiment was tested against Antarctic soil which was brimming with bacteria, it failed to find evidence of life. Thus, whereas the LR experiment demonstrated the presence of life on Mars, not surprisingly, the GC/MS provided negative results. NASA administrators, however, overruled the scientists who designed the experiments, ignored the positive findings and issued a statement falsely claiming that no evidence of life was found he in fact evidence of life was present. The business end of the current SETG instrument contains 2 cm x 2 cm microfluidic chip module containing tiny nanoliter wells where the real-time polymerase chain reactions occur. Tiny tubes feed in chemicals and blue light illuminates fluorescent dyes that help identify and analyze DNA molecules. Increasing evidence, such as the low temperature transfer of ALH84001, and theoretical calculations suggest that objects capable of carrying life have been transferred between solar system bodies with significant frequency. In addition, extremophiles have been discovered in Earth environments with high radiation and frozen conditions which, while not as extreme as those on Mars and other planets, demonstrate the incredible adaptability of microbes and suggest that habitable zones are much broader than previously thought. Together these facts raise the possibility that life could have been transferred between Earth and Mars perhaps early in the history of the solar system, and could survive on Mars to the present day. The SETG team is developing a very low power and lightweight instrument to test for life on other bodies, most immediately Mars, using the most sensitive known detector for Earthly life. The PCR strategy for life detection emerged from the exploration of the diversity of life, which revealed about 500 “universal genes” that are carried in the DNA of every known living thing on Earth. The gene that has changed the least over the past 3-4 billion years is the 16S (or the related eukaryotic 18S) ribosomal RNA gene. Ribosomal RNAs are the main structural and catalytic components of the ribosome, a molecular machine that translates RNA into proteins. It is the slow rate of change of the 16S gene that makes it the best detector of life. Within the ~1500 nucleotides of the 16S gene, there are multiple 15 to 20 nucleotide segments that are exactly the same in all known organisms. These regions of the 16S gene are essential for its catalytic activity and have remained unchanged over billions of years. The DNA sequence between the universal 16S gene primers contains so much information that organisms detected only by their 16S gene sequences are routinely classified based only on that information. This DNA sequence carries information about the organism from which the ribosomal RNA gene is derived, and can allow a new organism to be fit into the tree of life.Thus the detected product is a unique biosignature. Currently, hundreds of research groups use 16S ribosomal RNA PCR primers to prospect for new archaeal and bacterial species from a wide range of environments. Most of the life that is detected by PCR cannot be grown in the lab, suggesting either very slow growth rates or very particular growth conditions not met in the lab. Thus the previous culture-based exploration of microbial diversity missed 99% of the living world. Such surveys of extreme environments have expanded habitable zones from below 0 °C to over 110 °C, from acidic hot springs to highly radioactive reactor pools, to deep in the crust of the Earth, and has allowed particular 16S gene sequences to be assigned to particular metabolic strategies. The distinct environments of the Earth and Mars at present might not allow an organism adapted to one planet to grow on the other. But meteoritic exchange in the solar system was 100 to 1000x more intense during the heavy bombardment stage 4 billion years ago. There are signs of numerous fluid flows a possible ancient ocean, and sedimentary formations on Mars that suggest a warmer and wetter Mars 3 to 4 billion years ago, an environment more similar to Archean Earth. Fossil evidence suggests that by the Archean period, microbial evolution on Earth had already proceeded to the point of modern microbial morphologies, and biosignatures suggest that enzymatic carbon metabolism with isotopic fractionation had evolved by then. Because all known organisms have one or more copies of the 16S ribosomal gene, all organisms are thought have inherited their ribosomal RNA gene from a common ancestor. This common ancestor has been hypothesized to be an archaeal-like hyperthermophile 3 to 4 billion years ago whose metabolism exploited oxidation/reduction gradients. Thus at the time of maximal meteoritic exchange 3.5-4 billion years ago, microbial life on Earth may have already possessed a shared core of 500 genes, including the 16S ribosomal RNA gene. The last common ancestor with life on Mars may have also shared this core of genes. Thus at the point of high meteoritic exchange, there may have been microbial life on Earth detectable by 16S gene PCR and an environment on Mars more similar to Earth than today. Polymerase Chain Reaction (PCR) that is a detection strategy used to amplify the number of copies of a specific region of DNA in order to produce enough DNA to be further analyzed. A DNA sequence is the precise order of appearance of four different deoxyribonucleotides: adenine, thymidine, cytosine and guanine, abbreviated A, T, C and G, respectively. The technology of PCR involves adding stable 15-20 nucleotide long DNA primers, a stable enzyme nucleotide triphosphate monomers, and a simple heat pump that thermally cycles 20-30 times in 2 hours. Upon heating to 95°C and then cooling to 55°C, these DNA primers pair with their complement on each DNA strand, even if there are only a few DNA molecules in a sample. After heating to 75°C, the DNA polymerase will polymerize the nucleotide monomer components also in the tube to duplicate the DNA strands. There will now be four strands, where originally there were only two. If one repeats the thermal cycle with all the same components in the same tube, now there will be eight strands; repeat again – now 16, etc. Thirty cycles will produce one billion copies of the original sequences. The principle behind the real-time PCR method is that as the amplification process progresses, there is an increase in the fluorescence from the dye binding to double-stranded DNA molecules. As the dye binds to DNA, it undergoes a conformational change and emits fluorescnece at a greater intensity, which we can then monitor. PCR will even amplify complex mixtures of 16S ribosomal RNA genes from communities of organisms in environmental samples. Thus, PCR with DNA primers corresponding to the conserved elements can be used to amplify DNA from any species more than a billion fold, without need to isolate, culture, or grow the organism in any way. 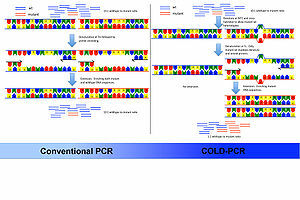 The PCR approach has added advantages of extreme sensitivity and robustness. PCR can detect a single DNA double helix in a crude sample. The biochemical processing of the sample can be as crude as a cheek swab from humans to agitation of dirt for soil microbes. PCR technology is very mature, with thousands of thermal cycling machines installed in small labs all over the world, and field PCR thermal cyclers used, for example, in the military to detect biological warfare agents. They are as standard in the modern molecular biology laboratory as toasters are in kitchens. A typical small thermal cycler not optimized for space flight weighs 3 kg and uses 100W. Only tiny amounts of energy are actually needed to cyclically heat and cool the 10-100 microliters of fluid in a typical PCR reaction, and to detect the product of that amplification. Real-time PCR uses a fluorescent dye that intercalates with double-stranded DNA in order to allow for simultaneous detection and quantitation during the PCR reaction. The SETG team is engineering an instrument for real-time PCR that incorporates all the fluid handling components on a single microfluidic module. Soils on Earth are considered to be a complex environment and a major reservoir of microbial genetic diversity. In the past two decades, progress in the development of methods to isolate nucleic acids from environmental sources and amplify them using Polymerase chain reaction (PCR) have shed light on a previously unknown diversity of organisms. However, since PCR is a highly-sensitive detection strategy, contaminants of metagenomic DNA can often interfere with PCR by inhibiting DNA and polymerase interactions. A variety of different strategies have been investigated for the purification of metagenomic DNA from terrestrial environmental samples, such as sample pre-processing, agarose gel purification, electroelution, gel filtration, combinations thereof, as well as commercially available DNA extraction kits. Nucleic acid sample preparation on the lab bench is highly labor intensive and time consuming with multiple steps required to collect DNA or RNA from raw samples. More recently, microfluidic systems have been used to solve the sample preparation challenge by reducing analysis time, reagents consumed, and reducing cross contamination. The SETG team is developing a microfluidic sample preparation module for extracting and purifying a raw environmental sample that will serve as the front-end of the SETG instrument. The definitive analysis of any PCR product is a DNA sequence determination. The current laboratory DNA sequencing technique, high-resolution electrophoresis, is not practical on Mars. Currently, there are a number of sequencing techniques available at the macroscale, which can be miniaturized to integrate into our SETG instrument. Additionally, some promising microfluidics-based sequencing technologies are now coming into the market, which we hope to collaborate with and/or draw insight from in order to develop a DNA sequencer that will meet our needs. For the flight instrument, all of the chemical and biochemical reagents will be need to be stored in a desiccated form. Though these reagents are known to be stable on Earth to cold and low level of radiation, their stability in vacuum and high solar radiation flux will need to be addressed during our development phase. In order to study how space radiation levels will affect the chemicals needed for a PCR reaction, the SETG team tested exposure of the reagents to proton, neutron, and heavy ion bombardment at levels on par to a typical mission to Mars. We are testing the survival of reagents on this mock interplanetary cruise, as well as Mars surface temperatures and radiation environments. The primary purpose of Project RedGENES was to collect bacterial and archaeal genetic sequence data from the extremely acidic watershed of the Copahue Volcano and the Upper Rio Agrio in Argentina. Chemical similarities to Mars make the site astrobiologically interesting and an ideal setting to carry out a field test of the SETG instrument. The field campaign began with a reconnaissance of the Upper and Lower Rio Agrio, followed by the selection of six sites for in-depth study. The team collected water and soil samples from a range of locations within the highly acidic, low cell density study sites. The instrument prototype performed well in the field, with excellent hardware and software execution and power requirements were met with the use of a portable external battery. Geochemical analysis and bioinformatical analysis are being performed to characterize the bacterial and archaeal communities in these samples, and SETG hopes to return to the field site in the near future to collect new samples and perform additional instrument tests. After all, it’s interesting to see such a project going on…Limitation? They live underground on Mars, that’s why the planet is so hard to reach for so long, that’s all. The rest (above written) is human SCIENTIFIC STUBBORN view of pure Sci-Fi. I’m sorry, but I only wish if someone would take a simple consideration to numerous stories of contactees around the globe, which is obviously impossible to ignore and easily comfortable to dignify as fantasy, sickness, search for a fame, money gain, etc..There is nothing but trouble contactees find from opening the truth and no one really listen. Is it ever going to stop?! Religion and science seem similar to me-both are stubborn: one is blind by unconditional and unproven faith; the other, by one side-of-a-view…pure facts of what can be proven from the view of known science and nothing else beyond and above is exist. As most aliens say, I must agree to, humans have no middle ground in anything. I’m done reading this.. WEIRD what it should be..science. Weird Science indeed, this article is full of bogus claims and wishful thinking. – Transpermia need cells survive two impact shock, while few healthy bacteria survives one, so is unlikely. Considering that we now know there were liquid water on Earth 4.4 Ga ago (I can supply references), and that the LHB was unlikely to sterilize extant cells, life was much as fast here as the putative life on Mars. There is no longer need for Mars transpermia; indeed, an established biosphere makes immigration further unlikely due to competition from already adapted life. – And the Viking conspiracy theory is totally off bonkers as they all are; further of course there could be no “proof” of life, it is science, but testing positive on an experiment; finally IIRC that gas release was later identified as isotopically derivative from Earth cleaners used to sterilize the craft so the putative positive was firmly rejected. Also, the article veers imperceptibly into a description from the SETG team. Bad reporting! can’t you cite any single sentence that is bogus or absurd? it has already been shown that panspermia is indeed possible. Bacteria can survive the condition after impact. See this analysis..